With a medium knowledge of C language it can be easily adopted to custom application. In my case I created an application which controls a lamp. Some time ago I built a light dimmer based on Atmel’s AVR Atmega32U2 microcontroller working also as a USB CDC, so it can be connected to Pi as a serial device. As you can see on a scheme below, it is a simple dimmer which allows to control 3 bulps separately. As a microphone I used webcam (Logitech 9000 Pro). As it is written in the tutorial after installation you can run sample recognition with: ‘./pocketsphinx_continuous’. This entry was posted in Electronics, Raspberry Pi and tagged electronics, pocketsphinx, raspberry pi, voice recognition. Bookmark the permalink. When I’m running this I’m getting undefined reference to ps_args.c etc. and the program si exiting. Can you please help. 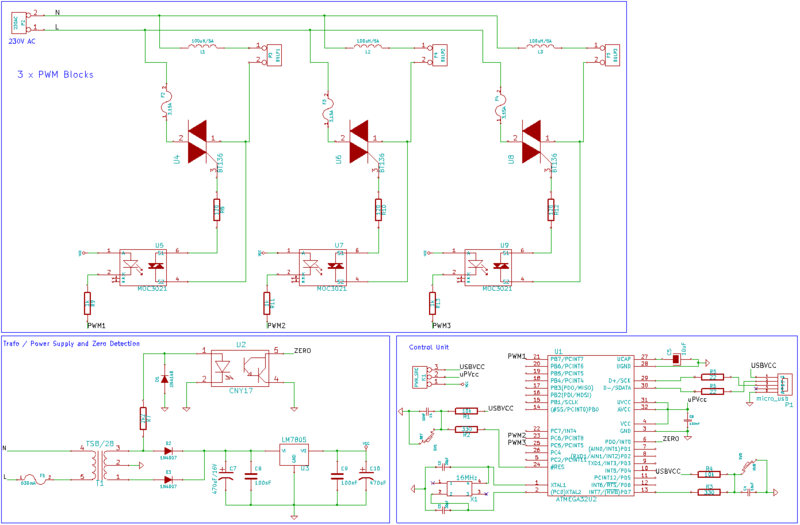 Could you please provide the circuit diagram for light dimmer? well, why not :-) I updated the post with scheme.